Elko County Fair hosted four trials on Saturday for the Intermountain Quarter Horse Futurity. ELKO, NV�AUGUST 28, 2015�Jrs Blue Boy stepped up Saturday from an $8,000 claiming victory in his first career start to set the top qualifying time in the Intermountain Quarter Horse Futurity trials at the Elko County Fairground. The 10 fastest two-year-olds, from the four trial races contested on Saturday, will return to the Elko County Fairground on Monday, September 7 to vie for the winner's share of a $28,165 purse going 350 yards. Ridden by jockey Jesus Canales, Jrs Blue Boy rolled to a one-length win while completing the 350 yards in :18.017 seconds to earn a 93 speed index and the top qualifying mark. Riley Moosman conditions the son of FANTASTIC CORONA JR for owner/breeder Sam Allie. 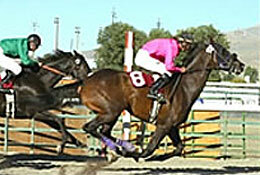 With a perfect 2-for-2 record, the gelding out of Lil Blue Blitz by Dash Ta Fame has earned $3,600 this season. For a complete list of Intermountain Futurity qualifiers, times, sires, dams, owners, breeders, trainers and jockeys CLICK HERE.